Planning 101 is a resource that provides greater detail on planning questions heard frequently through interactions with the community. Each topic relates back to Direction 2030 and references the plan through linked topics within the text. Be sure to check back to the Planning 101 section often as new topics will be researched and added monthly. One of the most frequently asked questions throughout the course of a plan is “what is the difference between future land use recommendations and zoning?” People commonly use the two terms interchangeably; and while the two topics are related, they serve different functions. In general terms, land use is the broad brush approach that defines an area for wide-ranging uses like commercial, residential, or industrial (among other categories). Zoning goes into much more detail on a variety of points, delineating factors such as specific types of commercial uses, minimum lot sizes for residential zones, and even topics pertaining to how the physical landscape is developed, like maximum building height or building location on the lot. The included interactive map shows the recommended land use layer from the Direction 2030 plan and zoning ordinances from around the county. A cookbook provides a good analogy to help illustrate how land use and zoning are related. Suppose you wanted to have a dinner party and decided to cook a few new dishes that you had never tried before. You would likely open your favorite cookbook to the chapter for the type of food you wanted to cook, perhaps a chicken dish, and then look through the different recipes. When you found a recipe that sounded appealing you would look through the ingredients list and then follow the steps to make the dish. In this example, land use is similar to the various chapters of the book (i.e. Baking, Turkey, Beef, Chicken, etc.). The chapters cover a broad swath of similar foods (i.e. Chicken) just as the various land designations cover a wide range of uses that are similar (i.e. Commercial, Residential, Industrial, Agricultural, etc.). Next are the specific recipes in the chapter, which are equivalent to zoning ordinances. Just like you can find several different specific recipes that are contained in one chapter (think back to the Chicken example), there are also many zones that relate to one land use category. Consider the Residential land use category for example. An area designated as residential could have ten or more specific zones that regulate what, how, and where buildings are constructed on the land. 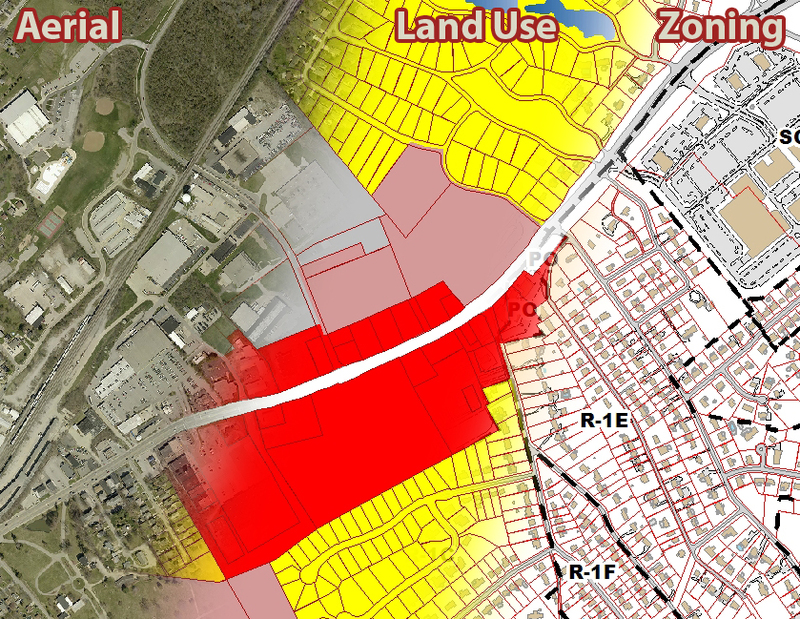 The zoning text specifies what is allowed within a specified area that is represented on the recommended land use map. The recipe example even applies to the essentials of the zoning code. The detailed element of a recipe, the ingredients, can be compared to the specifics found in the code such as permitted uses, area and height regulations, and other development controls. These detailed sections of the zoning code describe what types of uses are permitted in the zone, the physical constraints of where construction can occur on a piece of land, and additional items like outdoor storage and off-street parking requirements. Also, as with a recipe, substitutions can occur for ingredients. In terms of zoning, these substitutions would only be allowed under certain conditions. Ideally when a dinner with multiple courses is prepared, the different foods will complement each other. The future recommended land use has a similar goal; having complementary uses in close proximity. With the general direction of the recommended land use plan and the particular details refined by the zoning code working together, the end result will ideally be a community with uses that work.